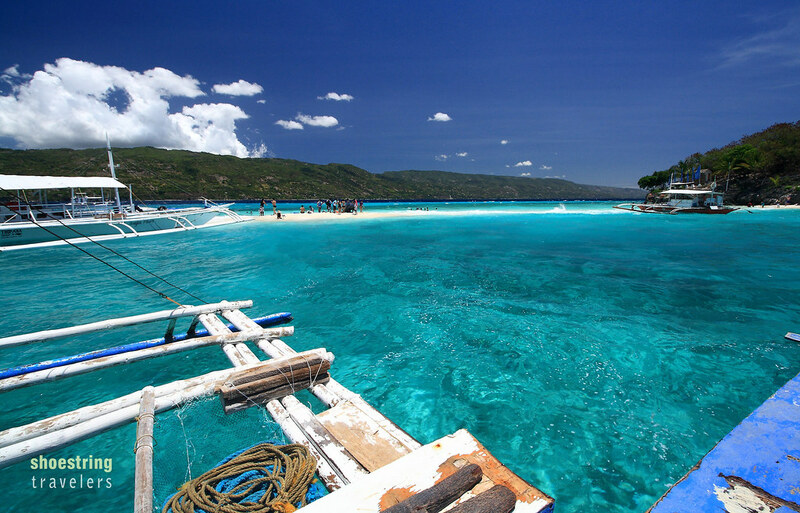 Sumilon Island is a small, 24-hectare island on the southeastern tip of Cebu just off the town of Oslob. It’s a picturesque island surrounded by pristine white sand beaches and therefore seemed an attractive side trip destination after our whale shark encounter at the latter. However, we did not even bother checking out a possible visit to the island knowing that a private resort occupied the whole place. Even a day trip here would surely be an extra burden for wallets already stretched for a 4-day vacation covering several destinations. A friend however told us that it is possible to visit the island without checking in at the resort. It turns out that the Bluewater Sumilon Island Resort has opened the most attractive natural section of the island – namely its white sandbar – to the general public for an entrance fee (P50). We just needed to rent a boat on the beachfront at Tan-awan, Oslob (the site for our whale shark-watching tour) to take us there. The trip took less than 20 minutes. Approaching the sandbar at Sumilon Island. The tide was already rising when we reached Sumilon’s sandbar but we still saw a good stretch of white sand trailing off from the island. Like other sandbars we’ve visited before, this sandbar must be visited at the height of low tide to see the sand fully exposed. But with our whale-shark watching tour dictating our schedule, it was just not possible on this day. One of the many boats parked at the sandbar; practically all carried tourists who just finished whale-shark watching at Oslob. Even with a considerable portion of the Sumilon Island sandbar submerged it was still an amazing sight. Crystal-clear turquoise waters blanketed the sandbar, the colors all the more beautiful, magnified by the clear blue skies above and the fine, almost blindingly white sand underneath. 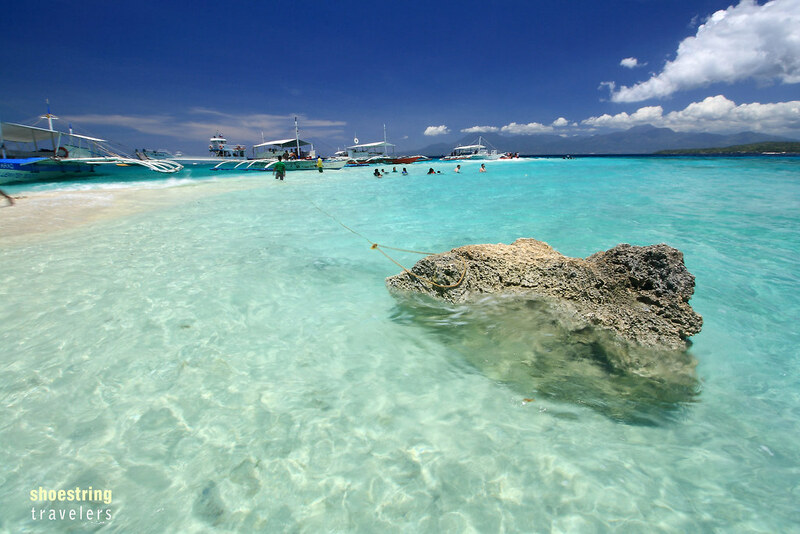 Lone coral rock with crystal-clear turquoise waters all around. Our first business on reaching Sumilon was: lunch! We bought this from one of the many food establishments or restaurants along the Tan-awan beachfront and ate it on our parked boat. Afterwards we had an enjoyable swim. The waters around the sandbar were shallow such that, even with moderately strong waves, it wasn’t risky to move around. We were careful not to test the far edges of the sandbar, however, since the sea bed suddenly slopes down at a steep angle there. 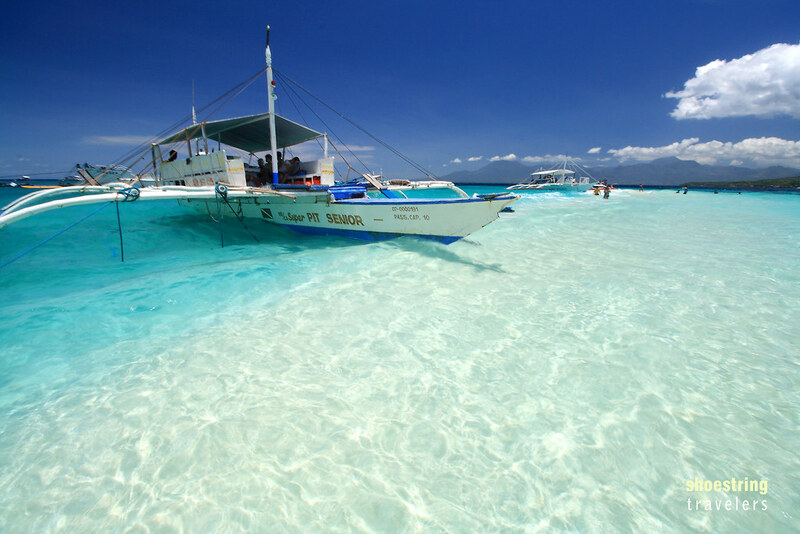 Our boat and the shallow waters of the Sumilon Island sandbar. After a while of frolicking around the sandbar we decided to climb the steps to a rocky promontory where the sandbar joins the island. There are restrooms up there that seem open to the public (at least the island caretakers didn’t stop anyone from going), but we also wanted to get a panoramic view of the sandbar. View of the sandbar from a vantage point on the island. Alike a few other sandbars in the Visayas, the Sumilon sandbar changes shape and shifts locations depending on changing currents and weather conditions. From our vantage point we got an even better appreciation of this sandbar’s beauty. We also noticed the sudden change in color of the waters at its edges from turquoise to deep blue. This signals a sudden drop of the seabed – a dangerous area for novice swimmers but also an area potentially rich in marine life and attractive to snorkelers and divers. Just like our subsequent stay at the Manjuyod Sandbar in Bais, many of us would be lulled to sleep after lunch or after bumming around Sumilon’s sandbar. Such is the sense of tranquility one encounters in this place. It was only after a thoughtful glance at our smartphones did we realize it was nearing mid-afternoon and that we had better get going for our return trip back to Dumaguete City on the Negros mainland. For directions on how to get to Sumilon Island via Oslob and for more travel tips, please go to this page. Posted in CebuTagged beach, Cebu, island, Oslob, outdoors, philippines, sandbar, Sumilon, travelBookmark the permalink. beautiful, I can’t wait to visit next month! Hi Lyndz. The waves were somewhat strong back in April but are manageable. I’m not sure if it’s the same thing in August but you can always check with PAGASA. We didn’t stay in Oslob. We just went on a day trip there from Dumaguete but there are several resorts in Bgy. Tan-awan (that’s the barangay in Oslob where whale shark watching takes place) where you can stay. Actually it’s better to stay at Oslob at least overnight so you can visit other attractions such as the Tumalog Falls and the Oslob Heritage Park. You can eat at the boat once it reaches Sumilon Island’s sandbar where the boat can park. It’s only 15-20 minutes away from Oslob. Nice post! Very informative! More power to The Shoestring Diaries! Thanks Jai. We must have left Sumilon at past 2PM and made our way back to Dumaguete in Negros Oriental. We were back in Dumaguete before 5 PM but that was because we had to wait for our ferry at Liloan port in Santander longer than expected, otherwise the trip would have been shorter. There are hourly ferries from Liloan port to Sibulan port on the Negros main island with the last ride at 7:30PM (am assuming you’re headed to Dumaguete – Cebu City is a different matter). Liloan port is 30-40 minutes by bus or trike from Tan-awan in Oslob while the fast craft ferry ride to Sibulan is about 20 minutes. From Sibulan to downtown Dumaguete is another 30 minutes – in good traffic. 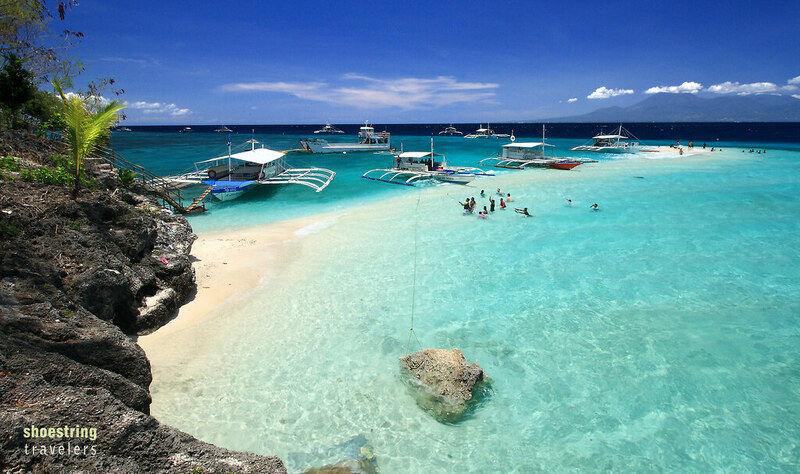 There are other spots to visit in Oslob and even in Santander. At Oslob, not far from the whale-shark watching spots at Tan-awan, is the Tumalog Falls. You can just rent a trike to get there. You can also visit the Oslob Heritage Park which includes preserved Spanish colonial era buildings. Non-guests at the Sumilon Resort can only stay on the boat on which they came (so better be sure that your rented boat has a shade). We actually had our lunch right on our boat which had docked at the sandbar. The cottages at the resort are for the resort guests (We only visited the sandbar and chose not to stay at the resort there.) They however allow non-guests to use the nearest restroom on the island resort. Can we join with the others? Im travelling but renting the whole boat is not practical.any suggestions? We didn’t try that at Sumilon since we were with our family. However you could try talking with other visitors about it. We’re sure they want to save money. We tried that at Kalanggaman Island last year with a Fil-Amercan couple who were very happy to share the expense with us.